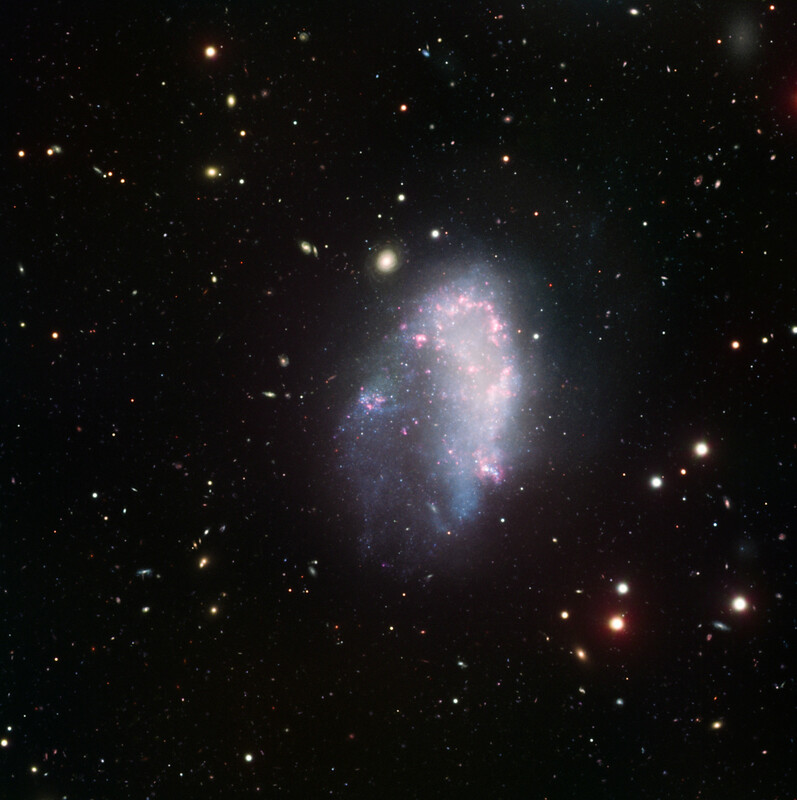 In this dazzling image, the galaxy NGC 1427A is seen as it travels through the Fornax cluster of galaxies, to which it belongs. NGC 1427A is an example of a dwarf irregular galaxy, a type of galaxy that is significantly less bright than regular galaxies and characterised by a peculiar shape. 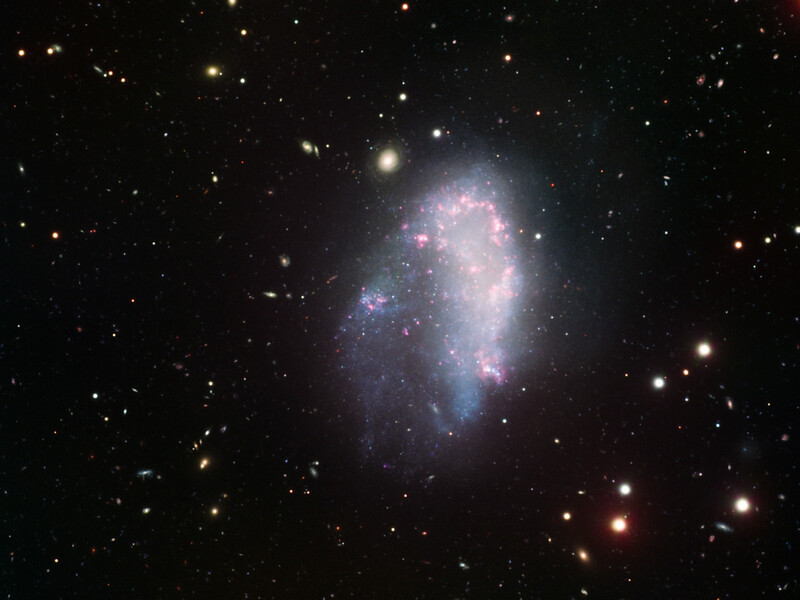 In this particular case, the shape of the galaxy has been forged by its rapid, upwards motion through the cluster: with a speed of two million kilometres per hour relative to the cluster, NCG 1427A is being torn apart and will eventually be disrupted. The interaction with the Fornax cluster has led to the birth of many stars, seen here as a boomerang-shaped region of young, glowing stars in the galaxy. 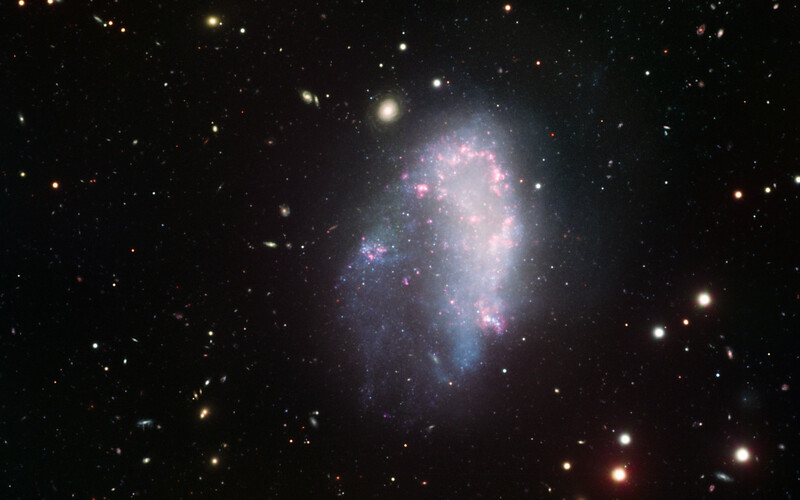 NGC 1427A exhibits a striking resemblance to one of our galactic neighbours, the Large Magellanic Cloud, which has undergone similar episodes of star formation, triggered by its interaction with the Milky Way. This image has been obtained using the FORS instrument mounted on one of the 8.2-metre telescopes of ESO’s Very Large Telescope on top of Cerro Paranal, Chile. It combines data acquired through four broadband filters (U, B, V, I) and a narrowband one (H-alpha). North is on the left and West is up. The field of view is 7 arcminutes. Position (Dec): -35° 37' 27.97"